Ember plastic grinders are an affordable way to grind your tobacco. They have diamond teeth and are very easy to use. They have a diameter of 60mm and can pack a decent size of tobacco. Uses magnet to keep the covers shut. They come in 3 parts. 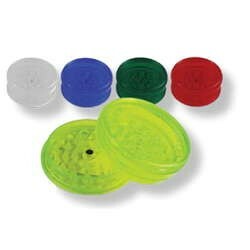 These are really affordable plastic grinders. They come in 3 colors (Green, red, blue.) We have them in limited quantity so grab them fast. 16 per box.